If you are like most new gardeners, you may think that simply tilling up the soil and planting some seeds or tucking in a few seedlings is all that is needed to get your garden off to a good start. It isn't. The area you choose and the amendments you add to your soil can make the difference between a lush, green garden overflowing with fruits and vegetables and a garden that struggles to survive. Choose a location with well-drained soil that receives at least six to eight hours of direct sunlight a day. Ideally, the area should be slightly raised in the center to allow for water runoff in heavy rains. Avoid sunken or depressed areas. Observe the area carefully for several days, noting the path of the sun and the amount of sunshine your garden bed will receive. Pay close attention to trees and structures that may cast a shadow during the summer. What may look like a sunny area in early spring may become shaded once deciduous trees are in full foliage. Till the soil to a depth of 8 to 12 inches. If the area has not been cultivated in the past, you may need to use a sod stripper to remove the sod first. Remove any rocks, roots or other debris from the soil. Hand pick any overturned weeds as these will quickly take root and begin growing if they are left in the soil. Test the soil to determine its composition, nutrient balance and pH level. An inexpensive soil test kit from the hardware store typically provides this information, but instructions for amending the soil may be brief. A soil test completed by your local extension office provides more detailed information and specific instructions for amending the soil. More info on soil testing and soil drainage. Spread the soil amendments over the top of the soil and work it into the top six inches of the soil with a garden tiller. In the absence of a soil test, spread a two to four in layer of well-rotted manure or compost over the area and till it in. Add fertilizer (5-10-10 or 10-10-10) following the application rate on the container and mix it in well with the soil. Rake the area smooth and mark the rows for planting. Determine the layout of your garden, according to the row spacing recommended for the specific vegetables you intend to plant. 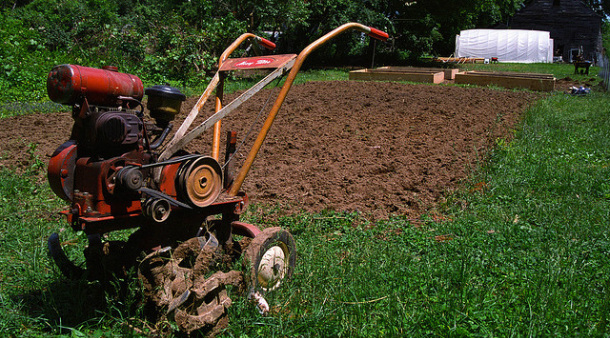 Many prefer to allow 2 ½ to 3 feet between rows for cultivation and weeding. Erect stakes at both ends of the garden and run garden twine or rope between them to create a straight row. Stand back a few feet and observe the layout. What looks straight from the garden may not be as straight as you think. Use the blade of the hoe to create a shallow furrow, following the line of the twine. Well-prepared soil in the right location gets your garden off to a good start and goes a long way toward producing that lush, green garden of your dreams. Time spent on preparation will save you both time and energy throughout the growing season, as you have already provided you plants with the vital nutrients and sunshine they need to thrive.